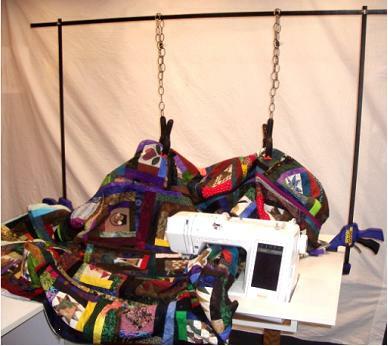 Free Motion machine quilting a large quilt on a home sewing machine can be a bit daunting. A few years ago I developed a system that makes free motioning a bit easier. I’ve been sharing it with my classes, but decided now to share it on my blog so that more quilters might benefit. I call the process Quilt Floating and it’s my way of suspending the weight of the quilt instead of fighting it! There’s quite a bit of information to share, so I’d like to do it in two installments. This week I’ll be sharing the concept, supplies and basic information. Next week’s post will include the specific set up instructions for all who are interested. Before we get to the actual frame, there’s a few tips I’d like to share. 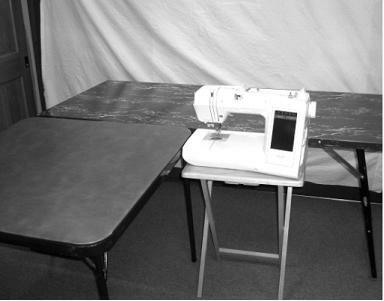 If your sewing machine is in a cabinet – great. It is also helpful to have some support to the left of the machine. If you don’t have any, placing an adjustable ironing board there is a good solution. 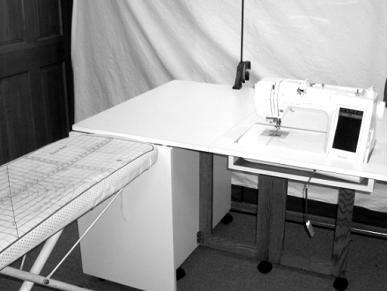 If you don’t have a cabinet you will want to find a way to avoid “sewing on a mountain”, ie: with the machine perched on top of a table or desk. Even table extenders don’t solve this problem with a large quilt because pins and folds of quilt get caught on the edges. My best suggestion is to place a card table in an “L” against your kitchen table or a banquet table. Then set the machine on a tv tray in the inside corner with enough magazines to make the bed of the machine flush with the tables. Now you’re ready to float the quilt. All of the supplies can be purchased at your local hardware store *. 2 Bull Nose Clips (3/4”) These can be found with office supplies. They are inexpensive and will clip and unclip the chain together very easily (not in the picture). 2 Slide Clamps (36” long) Both the old fashioned “C” clamps that screw to tighten or the deluxe new ones that pump tight will work. Choose the best quality clamps you can afford. I took my husband shopping and thus I own the Cadillac of clamps, but at least I waited until they were on sale. They are very easy to use! It’s important to have a hole in the bar at the non-clamp end for a rod or bolt to go through. 2 Spring Clamps (6” long) These are plastic, fairly inexpensive and have holes in the handle ends. They squeeze to open. 1. If your table/cabinet is less than 6’ wide and more than 1½’ deep you’ll want to place the clamps on the sides. For this arrangement you’ll need: 2 bolts and 2 wing nuts that will fit through the holes at the ends of the Slide Clamps and a 6’ piece of aluminum slat with holes at even intervals along the length. *If you quilt in a basement with exposed rafters you will only need the chains, bull nose clips, spring clamps and a couple of nails! Next week we’ll put it all together! Window View Challenge Deadline Extension! On another note – I’m having a lot of fun playing with new techniques on my “Window View” challenge. I’m thinking it would be a good idea to have an extra week or 2 to “get ‘er done” and so I’m changing the deadline from April 1st to April 15th. I’d appreciate getting a picture of your finished project by then for posting on that week’s blog. If you haven’t checked out the pictures of the current views, please click here. If you were thinking of participating, but needed more time, send me a picture of your view and jump on in! Thanks for the information. I might try quilting a large quilt someday. Looking forward to part two. Awesome idea – my studio is tiny, so this is a big help. Thank you so much for sharing this idea. I will be trying it for sure.